Anneal's SkyGW800 converts Skype to SIP, integrates IP PBX functions, to provide multi-Skype channels to make SkypeOut/In calls. Anneal's SkyGW-800 is the next generation Skype Gateway that integrates with IP PBX functions for small and medium business applications to enable multiple VoIP and Skype calls across the world. 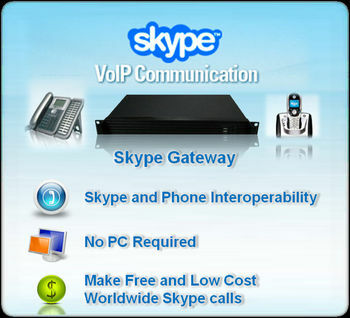 SkyGW-800 can convert Skype to SIP, providing up to 8 Skype channels (trunks) to make SkypeOut/SkypeIn calls. The SkyGW is designed for users to enjoy convenient usage, flexible access, and communication reduction costs. It is well-integrated with IP PBX functions in a unified system, which allows extension users to receive or make Skype calls directly by using the existing PBX key/Analog phones and PABX without using a computer. SkyGW-800 is interoperable with a variety of VoIP applications, such as: auto-attendant, conference, call transfer, call pick up, IVR, voice mail, recording and IP-based communications. IP Phones, Voice Gateway, and IP PBX can be used to interoperate with the SkypeGW and provide PSTN connections and extensions. SkyGW-800 helps business users to connect to the biggest global Skype network in the world to reduce communication costs, speed-up communication, and improve communication qualities. With Anneal's SkypeGW-800, small to medium enterprises are capable of making VoIP and Skype calls across the world conveniently with every type of calling device.